The Democratic Club of Santa Barbara is dedicated to activism on behalf of progressive Democratic principles through southern Santa Barbara County. We do trainings, election volunteering, Q&As with speakers, movie nights and other activities to create progressive change, foster community with other Democrats, and just plain have fun in a way that helps make our community and our country a better place. The Club meets once a month on the 3rd Wednesday of every month at the Eastside Library in Santa Barbara. Meeting locations do sometimes change–to join our mailing list to stay up-to-date, send us a note! 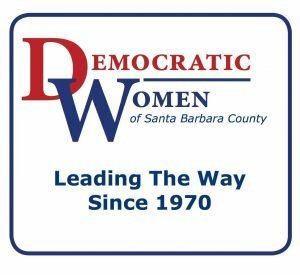 The mission of the Democratic Women of Santa Barbara County is to promote Democratic principles, issues, and candidates by educating the public, increasing voter participation, and ensuring election integrity, while collaborating with other Democratic organizations at the local, state, and national level. Visit our website to learn more! 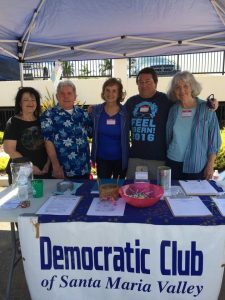 The Democratic Club serves Democrats of the Santa Maria Valley including Santa Maria, Orcutt and surrounding areas. The Democratic Club of Santa Maria Valley (DCSMV) is chartered by the Santa Barbara County Democratic Central Committee (SBCDCC). The Democratic Club of Santa Maria Valley is an official association of local Democrats who discuss, debate and work to promote Democratic ideals, candidates, legislation and issues for the common good. We are the official UCSB organization representing the California Democratic Party. Our goal is to fight for and defend Democratic candidates and values through out UCSB, Santa Barbara, and California. The Campus Democrats register voters, volunteer for local campaigns, go door to door in Isla Vista to talk to students about the issues affecting them, and much more. We’re also a super fun, active and social group. We host speakers such as Congresswoman Lois Capps, Assemblymember Das Williams, State Senator Hannah-Beth Jackson, candidates running for local office, various UCSB professors, and other prominent activists. (SYV-DO) SYV-DO was formed in 2008 in response to a groundswell of support for the Democratic candidates. 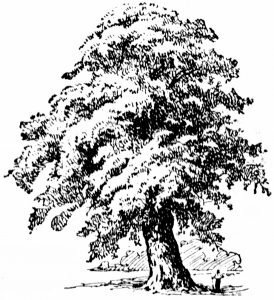 The organization serves the communities of Ballard, Buellton, Los Alamos, Los Olivos, Santa Ynez and Solvang. While the primary purpose of SYV-DO is to facilitate the election of Democrats, it also serves to provide a venue for local Democrats to meet and discuss issues in a congenial manner. Our goal is to promote the Democratic Party and its ideas, ideals, and candidates in Santa Barbara County. We pursue this goal through active outreach toward registered and potential Democrats, initiatives to increase Democratic voter participation, support of young candidates for office, and development of a permanent and active network of well-trained Democratic volunteers. The Club is committed to expanding opportunities for democratic political action and providing a grass-roots channel for the participation of like-minded young people. For more information visit our Facebook page.